First, take everything that follows with a lot of salt. In fact, don't bother with shaking out salt in the usual way: unscrew the top so you can dump the whole thing right on top of everything you read below. You might even want to go get the refill container and be ready to dump all of that, too. Not quite yet - I'll tell you when to pour it all on. 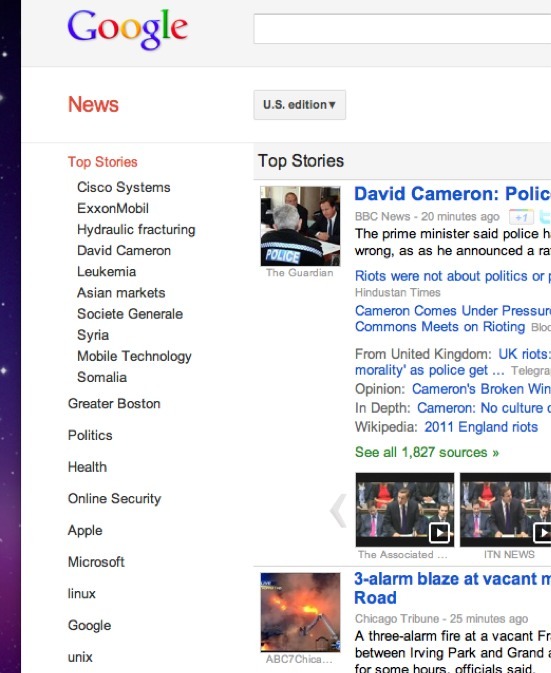 I've been reading Google News for quite some time - long enough that I don't even remember when I started using it. What I like about it is that I can personalize it by adding "sections" for subjects that I am particularly interested in. This lets me easily find news that I want. For example, because I live in Massachusetts, I have a "Greater Boston" section that keeps me up to date with local news. I also have sections for "Microsoft", "Unix", "Linux". "Google" and more. 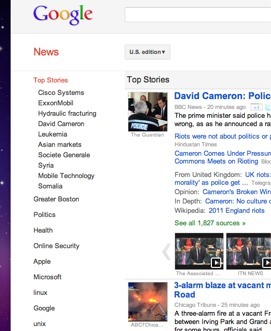 You may remember that Google recently added "badges" to Google News. While some blogs poked fun at that ("We Don't Need No Stinking Google News Badges"), these things are probably just part of Google's "Reputation" efforts. One of the interesting things about the badges is that they can tell me how many stories I have read in a particular section. For example, as of this morning, I have read (through Google News) 326 items about Google, 220 about Apple and 173 about Android. This is all since the badges were created; it keeps no statistics on whatever I might have read prior to that. Now, you might say "Oh, Tony is much more interested in Google than Apple or Android". Well, no: it would be more accurate to say that there have been more results presented in the Google section. As Google has been very active recently (introducing Google+, these badges themselves, being sued over Android and so on), that makes sense. I've also read 68 articles about Microsoft. Now there's a place where some bias might be present: I'm not all that interested in Microsoft. Those 68 reads are mostly because the article was also referencing something in which I have more interest. There is much more I COULD read about Microsoft if I cared to. How many Linux items have I read? Well, my Linux readers won't like this, because it's just 28. Yes, 28. Not 228, not 68, but just 28. That's all. That's definitely NOT because of lack of interest as it is with Microsoft, it's because the stories just were not there. "Oh, bull! There are mountains of Linux stories on the web!". I can hear you shouting that, yes. I agree, there certainly are. But there are not mountains of stories tagged that way in Google News and the Linux tag isn't being added to other stories. I only read 28 items because there simply wasn't much Linux to read about. Well, maybe it;'s just a quiet time for Linux news.. yeah, that might be it. Or it might be that Linux is quietly losing ground. "Losing ground, you idiot: every one of those Android stories was about Linux!". Yes, that's true - but they did not mention Linux, did they? I'd bet that many an Android user isn't even aware that Android is Linux. That ignorance is NOT good for Linux. The general public knows about Microsoft and they know about Apple and they may know about Android, but Linux is a mostly blank area in general cultural knowledge. Yes, it's still there in Android, but it's Android that is known, not Linux. Keep pouring on the salt, because I'm suggesting this does not bode well for the future of Linux. If this continues (and assuming Android manages to beat back its current patent troubles) Android may eventually become an important operating system that was once based on a backwater thing called "Linux" that only a few of us geeks remember. Perhaps more disturbing is the reports about Software developers favoring Mac OS Over Linux. Yeah, I know: you had to run to the store to get more salt. I get it: you can't imagine this happening. Sure, I agree.. but part of me still says that only having read 28 articles has to mean something..
-> Is Linux becoming insignificant? Sure. It means Google is a lousy news source and has become too big for its britches. Linux has never been a threat to anyone's desktop. This is not to say the Linux desktop isn't any good, just that the Linux crowd has done a very poor job of making it appealing to the unwashed masses. Linux is just a kernel. People have moved on and now are much more interested in what Linux can do for them rather then what Linux is. 'The Cloud' is almost all Linux. Search is almost all Linux. Financial markets use Linux. "Web 2.0" is almost all Linux. Android is, effectively, Linux. (which means the majority of smartphones being sold today run a Linux kernel) Embedded devices are dominated by Linux. Linux is huge and is growing more and more every year. When everybody is using Linux for everything, but don't really understand what Linux is... then you know that Linux is doing something right. The operating system itself is insignificant.. it's what you do with the operating system and the applications it enables you to use is what matters. It would be nice if Linux was better for the desktop then it is. That is the only way it will get penetration into the national consciousness. But you can't have everything. I agree: Linux is everywhere - just not in the News (except indirectly). This could be Google's fault too. Their requirements for sites to be included as news sources mention that they do NOT want "how to" articles and that would cover a lot of Linux news. Oddly, "how to" Mac and Windows articles make regular appearances in Google News, which might mean "We don't want how-to unless it's about stuff ordinary people use".